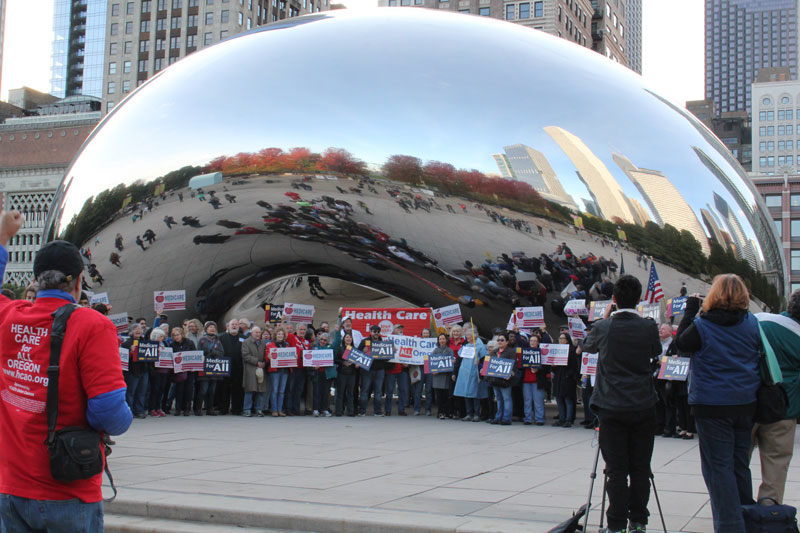 This is a wiki for posting notes, photos, powerpoint presentations, and video of the 2015 Single-Payer Strategy Conference hosted in Chicago, IL by Healthcare-NOW!, the Labor Campaign for Single-Payer Healthcare, and One Payer States. To see what other conference participants have shared, click on the workshop or panel below that you're interested in. Attendees will be asked to answer the following five strategy questions at the conclusion of the conference based on their participation in workshops, plenaries, and their conversation with other movement activists at the conference. The questions are designed to focus our discussions and help us move towards consensus on important movement priorities by the end of the conference. Each question has a dedicated wiki page on which you can post your own thoughts or quotes from the conference that will help us move forward on these crucial organizing decisions! We win when we build a social movement. What are some concrete, strategically smart ways that our organizing can intersect with broader social movements? The ACA is five years old and clearly the law of the land. Currently, what are the most important aspects of the ACA for our movement, and how do we address them in our organizing work? We look to breakthroughs at the state level to reignite the national movement for healthcare justice. After recent experiences in Vermont, California and elsewhere, what will it take to move state campaigns to victory? The current healthcare system reproduces inequities along lines of race, class, gender and immigration status. What are concrete ways we can confront these inequities in our work and within our own organizations? Opening Plenary - Jean Ross, National Nurses United; Richard Gottfried, Chair of the NY State Assembly Health Committee; Claudia Fegan, MD, Physicians for a National Health Program. Framing Questions For The Conference - Mark Dudzic, Labor Campaign for Single Payer Healthcare; Donna Smith, Health Care for All Colorado. Movement Action Planning for Single Payer Organizing - Benjamin Day, Healthcare-NOW! Telling Your Healthcare Story - Facilitator: Benjamin Day, Healthcare-NOW! When Your Legislator Says No - Facilitator: Benjamin Day, Healthcare-NOW! Online Organizing for Single Payer Activists - Facilitator: Stephanie Nakajima, Healthcare-NOW! The ACA at 5 Years: Medicaid Expansion and Immigrant Inclusion - Facilitator: Rita Valenti, Healthcare-NOW! Getting Past the Finish Line: The Single-Payer Movements in Vermont and New York - Facilitator: Donna Smith, Health Care for All Colorado. Presenters: Keith Brunner, Vermont Workers Center; David Sterrett, Sterrett Law PLC; Annette Gaudino, PNHP NY Metro; Marva Wade, NYSNA. Single-Payer and the Movements for Racial Equity and Immigrant Justice - Facilitator: Pilar Schiavo, Campaign for a Healthy California. Presenters: Betzabel Estudillo, California Immigrant Policy Center; Living Hope Wheelchair Association, Texas. Film trailer for "FixIt: Healthcare at the Tipping Point" – a documentary on business & the single-payer movement. Full showing of FixIt documentary – Q&A with the filmmakers and discussion of outreach and organizing. Small Group Sessions: Answer the Framing Questions of the Conference - Facilitator: John Lozier, National Healthcare for the Homeless Council. Closing Plenary: Next Steps for the Movement: Donna Smith and Sonja Rotenberg, One Payer States; Mark Dudzic, Labor Campaign for Single Payer Healthcare; Benjamin Day, Healthcare-NOW!